Mr. Riley (grade 6 RLA) and I recently team taught a lesson on what makes a good quality blog comment. It was an interactive lesson which ended with students coming up with a list of what makes a comment a good comment. The student list included everything on our list. Students also made connections between the new idea of blog commenting and another process they had learned for providing feedback in RLA class. So, in effect, their list was even better than ours. If you are interested, see the mini-lesson below for details. 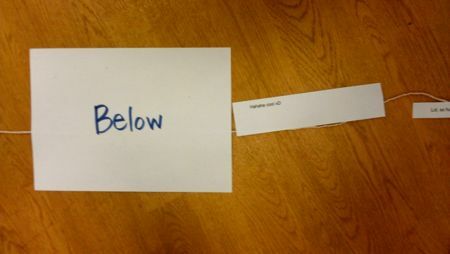 I had two big take-aways for the day. 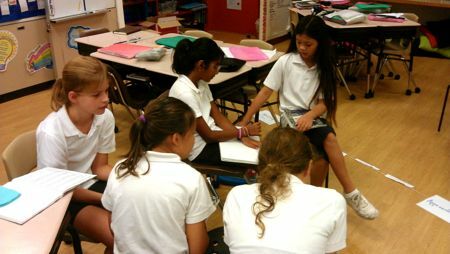 One - team teaching is a great thing. Mr. Riley sees the students every day. He knows them. He knows what they've learned and where they're going. I come in for one quick mini-lesson on blogging. I know where we want to go with blogging at our school. I can model the good blogging values we hope to foster in our new bloggers. But, Mr. Riley knows how to tie what I'm saying in with everything the students are doing. He knew to ask the right questions to call up prior knowledge from RLA class. Together we made accomplished the learning objective and we reinforced prior learning. It was a good partnership. Two - Mr. Riley is not only a great teacher, he is a fantastic new blogger. In his new role as literacy coach, he has started blogging for the teachers he supports. As I stood in his classroom talking with students about the importance of commenting in blogging, I realized once again that I need to live up to what I say. I need to blog more often so that when I talk to teachers about how valuable public reflection on teaching and learning can be, I've got something to prove it. Thank you Mr. Riley. Students read teacher blog posts and pick one to comment on. Write comment on sticky note and bring it to class. Talk about importance of comments - That’s where the conversation happens! One of the unique things about blogs is that bloggers are looking for comments. They want to hear from their readers. Hand out real comments from the middle school blog and other classroom blogs to each pair of students. Walk through continuum and read comments. Do a think pair share on what makes a good comment. 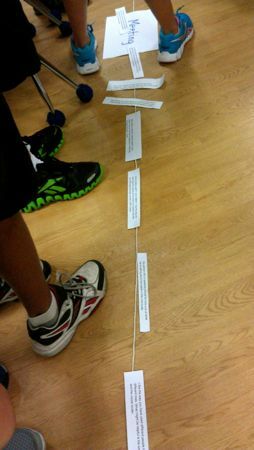 Students look at their sticky note comment and line up on the continuum where their comment should be. Revise comment and then go type comment on teacher blog. A comment should add to the conversation.